An art auction in K Road’s Te Karanga Gallery this month presents a unique opportunity to purchase works by twelve of New Zealand’s most exciting contemporary artists, all with a strong South Auckland connection. The auction is taking place in aid of the #2girls1conference campaign being led by leading South Auckland artists and educators Leilani Kake and Ema Tavola to support their travel to the Pacific Arts Association 11th International Symposium in Vancouver, Canada next month. Kake and Tavola are returning to North America with their ‘Real Talk’ arts agenda after a successful lecture tour to a series of California and Hawaii academic and arts institutions in 2009. Since then, Kake has exhibited her works in galleries including City Gallery Wellington and Henderson’s Corban Estate Art Centre and has been a featured artist in the 2011 Auckland Arts Festival. Tavola has guided the highly regarded Fresh Gallery Otara, which she established for Manukau City Council in 2006, to its sixth anniversary and 70th exhibition and was an associate curator of Auckland Art Gallery’s first major exhibition of contemporary Pacific art, 2012’s HOME AKL. Artists whose works feature in the auction include Tanu Gago, Rebecca Ann Hobbs, Martin Langdon, Molly Rangiwai McHale, Luisa Tora and Czarina Wilson. Their work, all with a significant link to the dynamic South Auckland contemporary arts scene, can be found in public and private collections both nationally and internationally. With reserve on each lot set at $200 and works ranging from framed video stills, unframed photographic prints, painting, lithograph and digital prints to Czarina Wilson’s impressive one-off garment, “Maori Minx” made entirely out of a repurposed mink blanket and shown at the 2011 Cult Couture Fashion Awards, there will be some very exciting purchases to be made on the night. 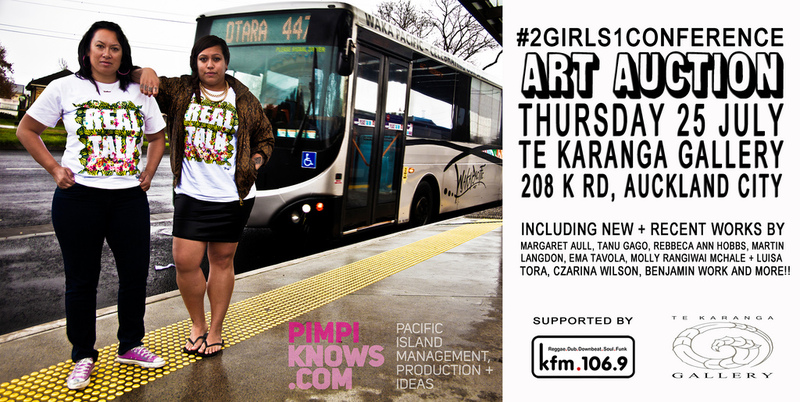 The #2girls1conference art auction is supported by K FM, Te Karanga Gallery. New and recent works by Margaret Aull, Kerrie-Anne Van Heerden, Martin Langdon, Nicole Lim, Steve Lovett, Ema Tavola and Benjamin Work.